First of all, there's the context it is being used in. A Saint Louis-area minister, for example, wrote of a "Black Lives Matter" sign being defaced with "All Lives Matter" written on the front and a racial slur written on the back. The fact that "All Lives Matter" is being used to argue against the idea that Black lives matter is proof that (1) People spreading that slogan don't really believe Black lives matter, at least not equally, and (2) It's therefore not true that all lives do matter equally in their eyes. The statement's use belies itself. If all lives matter, then black lives matter, so why the argument? Why the comeback? The comeback proves that statement false, and proves it for what it is -- a response born of fear and racism. Secondly, rushing to proclaim equality in the face of a stated injustice is a gross minimization of the very real struggles and injustices faced by African Americans in our country. To respond to "Black Lives Matter" with "All Lives Matter" is a response that minimizes, with its proclamation of equality, the current inequalities experienced. We've created a culture that says that if you're scared, it's okay to kill somebody, and it's completely reasonable to be scared of a black man, because all black men are scary, therefore they're at fault when they're killed, and the fact that they were killed while unarmed doesn't really matter. In our culture, black men are routinely killed for being scary -- scary because they "look like a thug," scary because they're wearing a hoodie, scary because they're holding a toy gun or a BB gun, scary because they might have stolen some cigarettes. The response to this culture has to be to begin by proclaiming that these lives matter -- Black lives matter. Lastly, the "All Lives Matter" response has been used specifically in rallies organized to support Darren Wilson, the officer who shot Michael Brown. On the surface, that seems to be a statement just supporting that police lives matter, too. And the lives of our police officers do matter. But use of the slogan in support of someone who has killed another person again supports the idea that some lives matter and some lives don't, like the one that was lost. Use of the slogan in this context says, "There's no way that this officer could have done wrong. We support him without question." And to say that there's no way in which this could have been anything else other than an officer doing his job takes us back again to the idea that black men are scary, bad, and if they get killed, it had to have been their fault. In short, the "All Lives Matter" slogan, with every usage, contradicts its message. If one truly believes that all lives matter, then what's important right now is to proclaim loudly that Black lives matter. Michael Brown's life matters. where Michael Brown was shot -- by Tom Schade. I just don't read "All Lives Matter" in the negative way that you've put it. My theology and my sense of morality place the "All Lives Matter" slogan above Black/White/Muslim/Christian/Gay/Asian/Jewish (take your pick) "____ Lives Matter". Although the case has many aspects to it, and I don't pretend to be a judge of what actually happened, I believe that Darren Wilson's life matters. But I wouldn't carry a sign saying "White Lives Matter." I can't begin to imagine the weight of the burden he will have to carry the rest of his life. His life matters too. I wish we could find some room in all these outraged blogs for some love, folks. Philip, I don't want to attack you, but I wish you could hear the sound of unexamined white privilege in what you wrote. There are times when the above-it-all view from 30,000 feet really doesn't cut it, and a more careful rereading of Rev. Landrum's post might acquaint you with some of the reasons why this is one of them. An invitation: If you are compelled to say or write, "All lives matter." or #alllivesmatter - Instead write or say a descriptive of a community, that you recognize but are not already a member of at the moment, in place of "all." For example, #blacklivesmatter, #queerlivesmatter, #poorlivesmatter, or #uneducatedlivesmatter, to suggest some options. Go ahead. It's ok to challenge yourself. Perhaps expand this challenge to include even broader descriptors, i.e. #misleadlivesmatter & #confusedlivesmatter. Caveat: Please investigate your context. If you are UU, and you always shift from something challenging or painful or uncomfortable to #all or "all," then now may be a very good time to become curious about universalism. Owning our full UU identity is reasonable and healthy. Maybe it's even our responsibility. Disclaimer: For better or worse, I've been universalist for decades, which is far longer than I've been UU. It has always made my life more challenging, as well as incredibly fulfilling, real, and resilient. https://www.google.com/search?q=minimization%20emotional%20abuse a lot of ppl don't realize that "minimization" is a form of abuse. The info in the illinois counseling center document should be required before anyone is allowed to pass as an adult IMO. Isn't "All Lives Matter" what we are striving for? Doesn't "Black Lives Matter" exasperate the problem and bring race into the equation and undermine the worth of other minorities and other races who are also being gunned down and affected by police brutality? All life matters includes blacks. Those commenting that #BlackLivesMatter is somehow "divisive" or "adding to the problem" need to RE-READ THIS BLOG. The entire REASON that #BlackLivesMatter must be said is because all too often agents of the state (such as POLICE), corporate-owned MEDIA and white people making comments ACT as if Black lives do NOT matter! So the point has to be made directly that Black lives DO matter and people are acting pretty dense to not get this. I can only say to my fellow white people: EDUCATE YOURSELF on the long long history of LYNCHINGS where NO ONE WAS HELD ACCOUNTABLE for murdering African-American men, women and children---and how today that history CONTINUES primarily by law enforcement. OPEN YOUR HEARTS (& hopefully your mind will follow). And I am speaking out of 35 years experience doing anti-racism and police accountability activism and independent journalism. So, I know what I;'m talking about and can only urge my fellow white people to educate yourselves much more deeply and to connect with a sense of HUMANITY on this issue. If you lose your dream, you will lose your mind. MLK's dream was that one day his children will be judged by the content of their character and not by the color of their skin. I have the same dream for my daughter. While I check the "white" box on forms, she is not "white." What I don't want (and dare I say what MLK didn't want) was that we should equate our groups to be equal but divided. Take for example, "Miss Black America." This organization and the contest was founded by a family in 1967 that didn't believe that their daughter's dreams of becoming Miss. America were attainable. So, they added a wedge of division and created Miss Black America. Ironically, another family with a daughter who was 4 in 1967 kept MLK's dream and, Vanessa Williams did become the first Miss America. My point is that any division is going backwards against the progress that MLK dreamed of. How about we actually say what is blatelnly true in our world that not all lives matter. Never addressed is matter to whom? All of these statements are loaded as political propaganda in a time when debates are leveled to less than 140 characters, now they are Hashtags. We need deeper conversations. Our society has a long way to go to get to a status where any lives matter. Those who wield the power don't care about those without the power. Whites do receive some bias in their favor, but shouldn't fool themselves into thinking they are in the "It" club. This is more a class issue than race. The powers that be are using race to divide everyone they want to control. These comments are redic. It is all about race, simple and plain. if it were about class, then you would see poor white people being shot. Lets not run away from the issue here. Blacklivesmatter was created because the world does not value Black lives. It is not meant to be divisive. Everytime some one says "You are playing the race card" or "Stop bringing up race' means that you are uncomfortable with Black people pointing out racism. You all have some interesting views on race. I do want you to understand that people of other cultures feel that their lives matter too, and for many, this is what the "All lives matter" slogan represents. Muslims, Hispanics, people of mixed race, homosexuals, women, and many other oppressed groups who don't identify as Black can feel alienated by this statement and are left wondering if their lives matter to the Black community. The solution is for us to work together, to love each other, and try to understand one another. #BlackLivesMatter is an understandable reaction to a perceived lack of relevance, but its effect is to push an already swinging pendulum. #AllLivesMatter is simply an effort to stop the pendulum. We don't need public opinion, our own mental states - however you want to characterize it, to carve out some special designation for any group. We need police to treat all good people the same way, and all lawbreakers the same way. And I resent some people saying that if you're not behind BlackLivesMatter, you somehow haven't done enough introspection or aren't understanding the problem. We are trying to follow the path set out by MLK Jr. and others to stop dredging up the past and just be the best people we can be to all. This all reminds me of when my dad (who is really one of the most accepting guys I know) wondered why his UCC Church should go through the Welcoming and Affirming process - or, in a way, put out a 'special welcome mat' for gays (etc), when the church by definition was welcoming of all. I was like I dunno if a church that considers itself welcoming of all should do that dad, but I can tell you that as a lesbian I would need a church to have that special welcome mat, for me to join you. This was years ago, and maybe it says more about my fears than what was strictly the best theology, or the most equitable approach, or whatever. Others can argue that. But what I can say is, if you are white, or in a predominately white congregation or community, and one of your goals is to communicate that blacks are safe among you -- 'All Lives Matter' just isn't enough. I totally agree with you Rev. Cynthia. Saying that all lives matter reminds me of what I have heard said from the U U pulpit at Christmas time. Immediately following the statement about celebrating the birth of Jesus comes the statement "but all births are special". Well of course, but saying that deflects our attention from the reason for the season and perhaps serves to assuage the feelings of those who might take offense. Black lives matter slogan focuses our attention and thinking in a way that saying all lives matter doesn't. Stating that all lives matter is a way of denying the real problem of how racism continues to express itself in very painful and tragic ways. 1) Support both "Black Lives Matter" AND "All lives matter" - this is in effect saying that all lives matter, regardless of skin color, but right now we need to focus on black lives because they are currently being undervalued. I personally fall into this category. 2) Support "Black lives matter" but NOT "All lives matter" - this is in effect saying that black lives matter but other lives don't. Could be rephrased as "Only black lives matter"
3) Support "White lives matter" but NOT "Black lives matter" - this is in effect saying that black lives dont matter, but other lives do. Could be rephrased as "Only non-black lives matter". 4) Support NEITHER "Black lives matter" or "All lives matter" - in effect saying "No lives matter. If you believe this you probably have serious issues. I'm tired or people feeling they have to choose sides and support either "Black lives matter" or "All lives matter". They are both true, so support both of them. "All lives matter" ensures the movement can be supported by people of all races without feeling alienated, and "Black lives matter" brings attention to the specific (and important) issue at hand. Supporting "Black Lives Matter" does NOT mean that all lives matter. 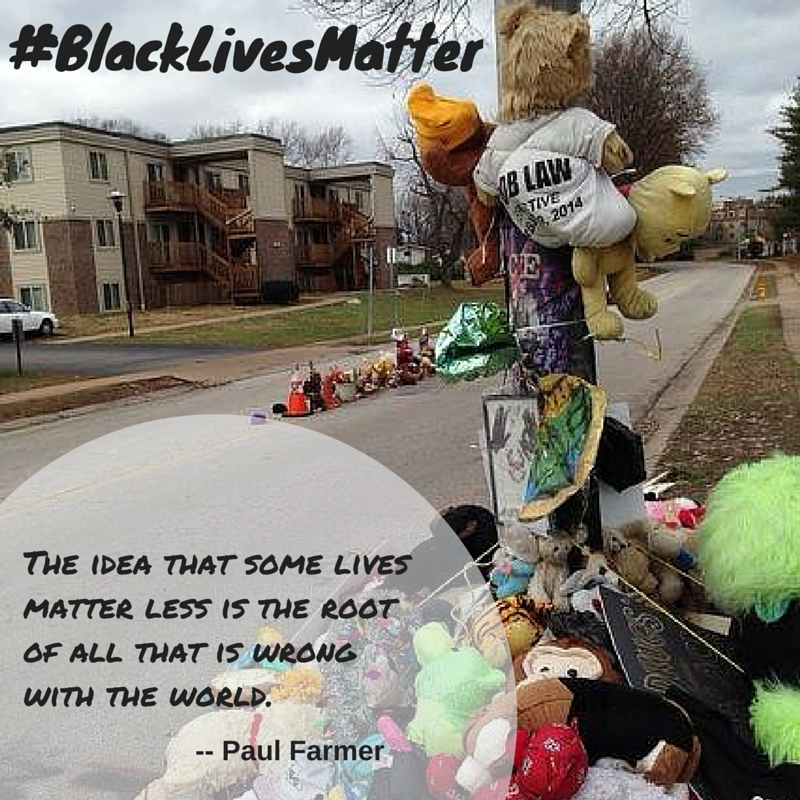 Expressing that one thing matters (black lives) does not mean that other things (everyone else's life) does matter. That is English comprehension 101. For the same reason, if a person says "chocolate tastes good" that does not mean that other foods don't taste good. It just identified chocolate as tasting good. The person may also like the taste of fried chicken, pizza, green salad, or any number of other things. Just because they like chocolate does not mean they dislike everything else. My problem with the "all lives matter" people is that they are extraordinarily hypocritical. If all lives truly matter, then those folks should be upset that some lives, namely black ones, are ending for no good reason. Yet they have set themselves up as the opposition. Black lives do matter. If you truly believe all lives matter, then what is there for us to argue or disagree about? Saying Black Lives Matter is not saying that other lives do not matter. That statement is an emphasis right now because we are learning about the inequality posed to African Americans in many arenas, but especially in the use of lethal force against them in law enforcement. The stories that are coming out make an unbiased and caring person ask, "Would these fatal outcomes result if the person was not of color?" Perhaps the slogan could have been indirectly less susceptible to the charge of special treatment if it were, "Black Lives Matter Also." The response, "All Lives Matter," misses the point trying to be made, diminishes and criticizes it, and denies it. The Statement "All Lives Matter" in response to the statement "Black Lives Matter" is really cover for someone who is taking issue with the statement "Black Lives Matter." Is that okay? Well how does one feel about someone who wants to make a particular biased statement in a way that appears as if the person is really unbiased toward everyone. I think that this is what is happening in this case. I think the follow on questions for those denying that "Black Lives Matter," is to ask, "What's wrong with singling out a societal problem with a slogan to draw attention to it?" "How do you feel about recent events in Ferguson, MO and elsewhere of a similar nature?" "Do our police need more anti-racism training to more effectively police?" "Could our white police force benefit from empathy gained from being literally in the shoes of African Americans, for example, by being in disguise in the African-American community for a few days?" Other ideas? This problem needs some creative solutions to change hearts and minds! Another reason why "all lives matter" is completely detrimental is that it demonizes "black lives matter." It makes BLM into something it is not-- an attack on every one else, thus a cry of distress due to a broken system becomes not a call to proper action, but an affront to others. A group of people are subjugated and then accused of trying to subjugate others simply by saying they shouldn't be subjugated. So it leaves them with two choices, either a) weaken their original cry by using the word "all," or b) appearing aggressive to everyone else. Stop using ALM! it's another form of suppression, even if you don't mean to, it is. This brought up another question in my mind: when UUs claim to be "Standing On The Side of Love," are they implying that people who take opposing stances on issues are "standing on the side of hate"? Let us not forget the events to which phrase "Black lives matter" responded. To replace it with the platitude that "All lives matter" is to ignore those events, to reduce the phrase "Black lives matter" to a mere literal statement with no contextual meaning, to completely miss the pain and the anger and the irony of having to say what should be obvious but is not. Day after day young black males were being shot dead by police, in far greater numbers than their proportion in the general population. Time after time the police doing the shooting were not held accountable. The nonverbal message appeared to be loud and clear: black lives don't matter. Let us respond loud and clear: Yes they do. Black lives matter. It is an act of love to proclaim BLACK LIVES MATTER. As a matter of fact it’s one of the most loving statements of our generation. Why? Because too many in the black community have felt unloved, unlovable. To life BLM is to reconstitute and reorient our collective gaze away from whites as a standard bearer of goodness and worthy-ness. It’s intent is to radically awaken the deepest instinct within us to survive and to flourish, feeling safe as we go. No less than whites feel on any given day. To feel the need to silence the “Black” in lives matter is very telling and shows the hypocrisy of the left where the statement originated from. I am a UU of Indian origin, I do not feel the Black Lives Matter movement in any way or form makes other people of color left out or diminished. Our church Banner has been stolen 3 times and the last time the steel posts were stolen too! The very fact the people who oppose this slogan would go to such lengths tells us something. I just returned from South Africa. There Apartheid is openly acknowledged and spoken about with regret and described as a very dark period in the history of that country. Tourists are taken to Robben Island where Nelson Mandela was imprisoned for 18 years. Former inmates serve as guides. I have never seen regret for slavery acknowledged openly in this country. Movies like 12 years a Slave have a predominantly Black Audience! People often add a virtual 'Only" before the slogan Black Lives Matter to argue that All Lives Matter. Why can't they see the desperate "too' at the end of the message? !